Celebrate Chuseok, meaning “Autumn Eve,” with a live concert featuring traditional Korean dance and music. Chuseok (September 23-25, 2018) is a major harvest festival in mid-autumn, also known as Korea’s three-day version of Thanksgiving. 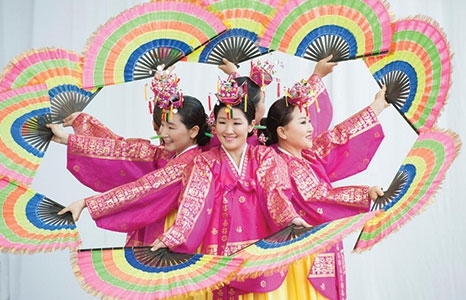 Don’t miss this vibrant showcase of traditional Korean dance and music in the islands. Officially opened in 1950 by Halla Pai Huhm, the Halla Pai Huhm Studio is the only continuous source of Korean dance and music in Hawaiʻi. The studio is committed to maintaining the tradition of Korean music and dance performance established by Halla Huhm and to supporting a broad array of Korean dance and music activities. Myong Woo Dahn was established in 1997 with the purpose of studying and practicing of Korean folk dance and music. During the last two decades, we’ve performed not only for the local Korean community but also for local nursing homes and fundraisers for children with illnesses.